Now I can call myself a GameBook user! The first setback of my project came along sooner than I had expected. After creating a profile online I found out that GameBook app is not available for my Nokia phone. Damn! It is something that is being worked on though. There is no exact schedule for GameBook being available for Windows phones, but I’m hoping that day will come soon. We’ll see. Luckily my friendly colleagues here promised to lend me an iPhone so I could get started. And I did. Get started that is. I’ve played a couple of rounds with GameBook during the past week. I don’t know if it’s a coincidence, but those were pretty much the worst rounds of golf I’ve played this summer! I don’t blame GameBook for that. It actually helps you stay on top of your game and keep motivated throughout the round. My problem was that I had completely lost my swing and went to see a pro a day before my first round with GameBook. He gave me instructions that without a doubt will be great in the long run, but take some time to settle in. And as a result I didn’t play so well the next couple of days. The first great thing I noticed about GameBook is that it tells you how you are playing compared to the level that you should be playing on. There is of course the par of each hole to aim for, but if you are playing with a handicap over 20 like me, that’s not always a realistic goal. 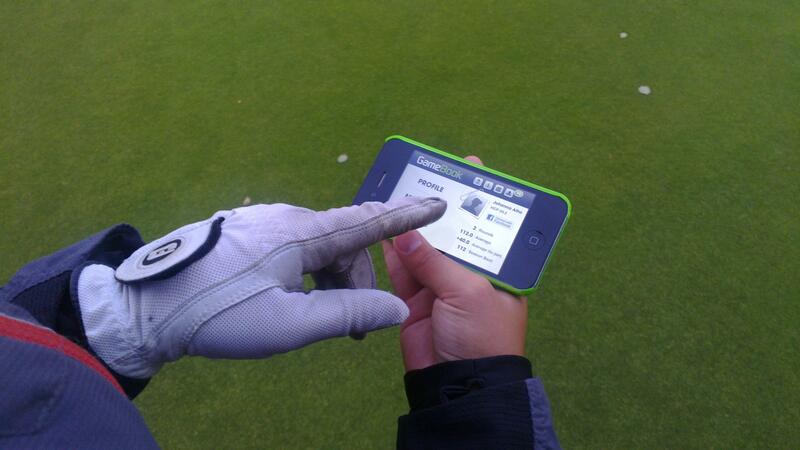 With GameBook you know on each hole what you should score to achieve your own level. I’m personally not too keen on mathematics and when I’ve been keeping score the traditional way, I haven’t really bothered to count my results during the round. It was an interesting experience to see after each played whole if you were playing according to your handicap or not. The live leaderboard of your game is also a fun feature. Even more so if you end up on the top of it instead of the bottom! At first it felt a bit weird to be walking around the golf course with a mobile phone in my hands, but I got used to it rather quickly. And it didn’t take any more time to mark the scores with GameBook than it does with a pen. So that’s nothing to worry about. What worries me a little is that GameBook makes my bad results visible to a wider audience than I’m used to… But more about that the next time.